Many people seem to believe that the CBOE’s VIX Futures market is attempting to predict upcoming CBOE VIX® values. I think they are mistaken. Most futures prices have very little to do with predicting the future. Futures contracts were invented to allow producers/consumer of commodities to limit their business risk by locking in future prices. In exchange for eliminating price risk, they give up the potential for increased profits if markets later moved in their favor. Traders wasted no time using futures for speculation, not because they somehow foretell the future, but rather because the low margin requirements for futures allows them to heavily leverage their bets. Prices for futures contracts are constrained by arbitrage. For example, if an arbitrager sees the premium for Dec 2016 E-mini S&P 500 futures rise above a certain point they will short E-mini contracts and buy the appropriate amount of stocks in the S&P 500 (or just short SPY). From this point on they don’t care what direction the market moves—they are perfectly hedged—a risk-free position. The transaction is triggered when there is sufficient difference between the current S&P prices (the “spot” price) and the December contract bid price to compensate for their cost of capital to buy the stocks, account for dividends, and deliver the target profit. Alternatively, if they think the futures price is too low, they reverse the transaction, buying the future and shorting the S&P 500. Companies will differ in how much premium they require between the spot price and the futures price but the net effect is that E-mini prices trade between these boundaries—they aren’t a divination of the S&P 500’s value in December 2016. For physical commodities like corn or natural gas, the cost of storage is included in the futures pricing and in some cases seasonality. For example, prices for corn might be depressed during harvest time because some producers want to move the product directly to market so they don’t have to store it. Arbitrage for VIX futures is a much trickier thing. You can’t buy volatility on the spot market and store it in your garage for a few months. The best you can do is buy or sell the appropriate set of S&P 500 (SPX) options—the ones that expire 30 days after the settlement date, and eventually subject yourself to the settlement process. 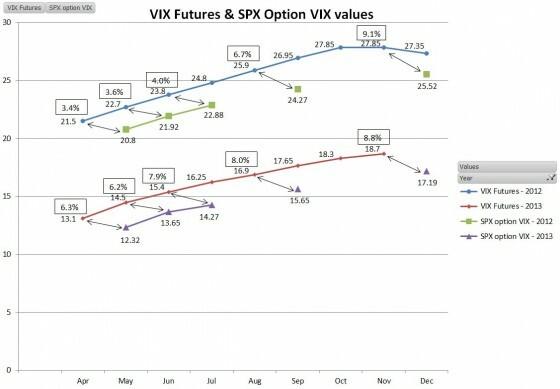 Settlement is via the tweaky Special Opening Quotation (SOQ) process, which can’t even tell you ahead of time the full set of options that will be used for the settlement and in the last year has differed from the VIX opening price by as much as +4.27% / -3.8% on the morning that VIX Futures settle. 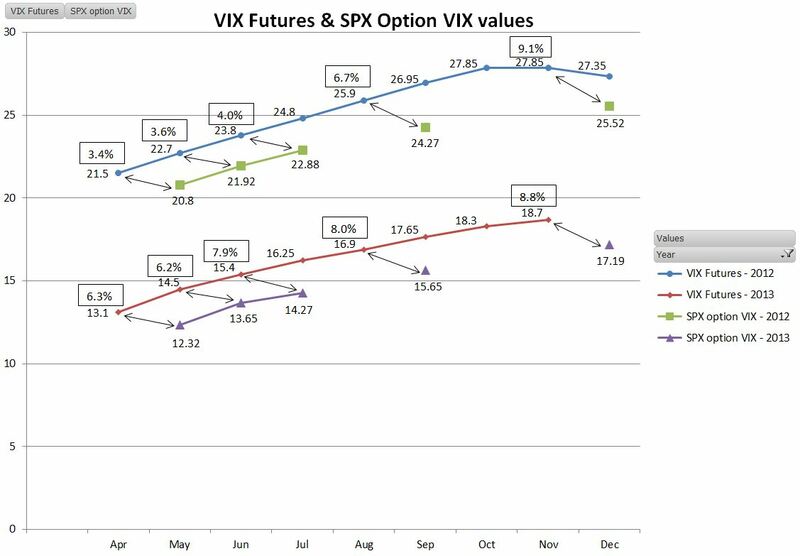 Monthly SPX options are only available for the next 4 or 5 months, so the options associated with further out VIX futures expirations (up to 9 months out) are sometimes not even available. Clearly, market makers in VIX Futures must have other ways to hedge their positions (e.g., VIX futures spreads, VIX options, calendar spreads of SPX options). Since the notional value of the SPX options market is currently much bigger than the VIX futures value it is reasonable to assume that the VIX futures tail does not wag the SPX options dog. So the question becomes, what sets SPX options prices, and indirectly their implied volatility? Are the market participants seers or are there other factors at work? Insurance is a better model for predicting SPX option prices. Investors use option strategies for price protection (e.g., fully hedge any market moves below a certain price), and as assets that reliably go up during serious market corrections or panics. Even if your puts aren’t in-the-money, they still go up a lot when volatility spikes. An insurance company doesn’t try to predict when you will have losses on your house or car. It looks at the statistics and then charges a constant monthly rate they believe in aggregate will cover the claims they receive and over time deliver a reasonable profit. 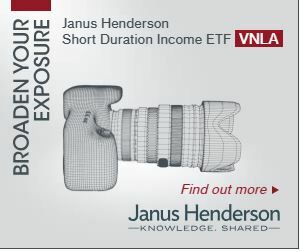 I think the VIX Futures market looks a lot like an insurance provider. The VIX Futures term structure chart during quiet markets has gotten more linear in the last couple of years. This shift has dramatically increased the contango in the mid-term futures—much to the chagrin of the XVIX, VXZ, and XVZ ETNs. On the other (inverse) hand ZIV is a happy camper. Eli, from VIX Central speculates the curve straightened because there used to be a low-risk trade of shorting a VIX future month right before it started sliding down the steeper portions of the curve while being long the month after it as a hedge. This trade might have just gotten crowded or perhaps the increased volume in the later month futures driven by the volatility ETPs made the market more competitive.